Electric car maker Tesla released its pricing for the upmarket Signature edition Model X SUV earlier this year, and now it has revealed what the cheapest model will set you back – $80,000. And that’s before adding any options. Your $80,000 will get you the 70D model, which is an SUV with all-wheel drive. It has a range of 220 miles, does 0-60 in 6 seconds, with a top speed of 140 mph. The base version is a five seater, but you can add an extra $3,000 to that price tag if you want a six seater, or $4,500 for the seven seat version. 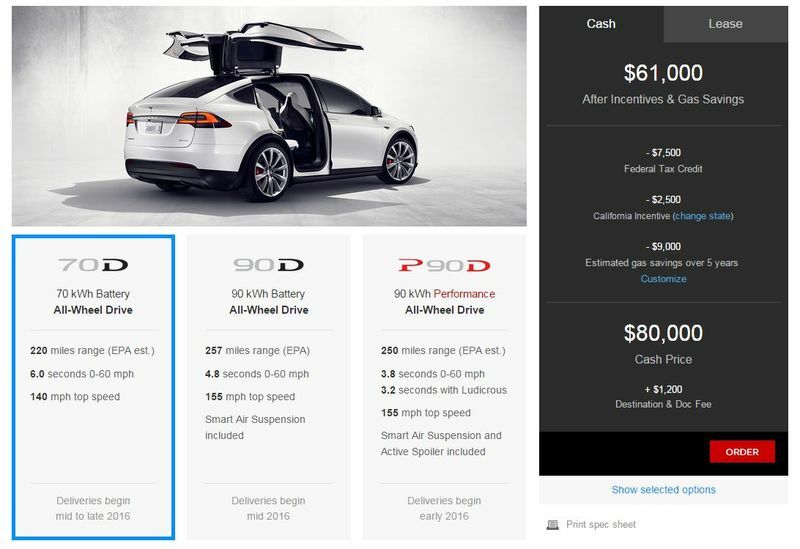 Pricing for the faster and higher spec 90D and P90D models is yet to be revealed. When Elon Musk, founder of Tesla, described the Model X range, he said the aim was to make an SUV that had the function of a minivan. This is being achieved by the Falcon wing doors, which open up and out to give you more access to the back seats . Model X customers can now go through Tesla’s configurator to choose between the 70D, 90D and P90D, as well as selecting the additional options like color and interiors. General production of the 70D Model X has not yet begun, but is expected to get underway in the first quarter of 2016 with delivery dates listed on Tesla’s site for mid-to-late 2016. In the meantime, you can start saving your pennies since you know what you’re aiming for now.